In partnership with the cosmos, a team of Delta professionals set out to capture images of the airline's new flagship aircraft, the A350-900, against a truly unique backdrop: A "super blue blood moon eclipse​​. "​ Mother Nature last offered such a view in 1866. The result – a jaw-dropping viral video that became Delta's most successful Instagram post ever – was a triumph of months of cross-divisional planning and stellar execution. Not to mention a lot of creativity and, in the end, perseverance when it seemed the "money shot of a lifetime" was in jeopardy. "The A350 is nicknamed 'the Starship,' so there was not a more perfect airplane for the super blue blood moon eclipse," said First Officer Laura Lucas-Edwards, Delta's A350 instructor pilot who flew the A350 for the special project in tandem with First Officer Shane Capaldi. "To get to work across the operational divisions with such a top-notch Marketing department and then the outside vendors, I'd never seen such an amazing production." The shoot was Delta's fourth in a series of "air-to-air" videos undertaken by the airline's Marketing team when a new aircraft type enters the fleet. Capturing such dynamic images means one aircraft carrying videographers and their gear filming another airplane in flight, often at top speeds. It's extremely challenging work. But Delta's Visual Content Marketing team, led by Mary Welsh and Chris Fisher, are well-seasoned in what it takes to capture Delta's iconic air-to-air imagery. The video posted last month is just the first in a series of dynamic images of the A350 to be unveiled in months to come. Months before going up in the air with specialized camera gear, Pouya Dianat of the Atlanta production company BEAM, suggested using the coming meet up of a Blue Moon, supermoon and total lunar eclipse as the backdrop to end all backdrops. "It started as a sketch on a white board," said Pouya, a frequent Delta partner. "We were creating the world's toughest billiard shot." Pouya is also no stranger to Delta air-to-air shoots, having worked on a 2015 filming of a new A330 that combined gorgeous aerial imagery with thrilling shots of takeoff captured from a speeding Porsche (on the ground). The A350 project was complex from the start. The first night in flight was something of a trial run for the next day, when the eclipse would take place. 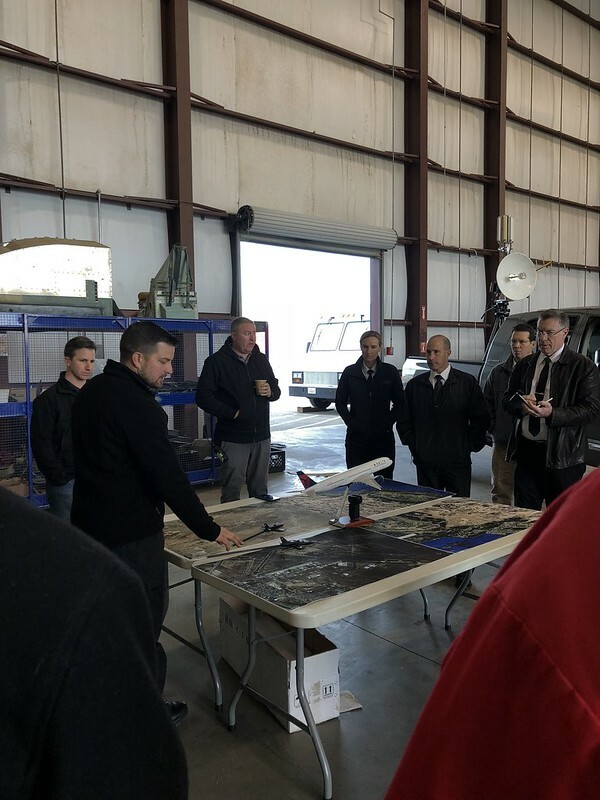 "It was a very unique opportunity for us to get some hands-on flying and to interact with an incredibly professional group," said Delta Capt. Mike "Popeye" Doyle, Chief LCP for the A350. Popeye occupied the Captain's seat, serving as a production director inside the flight deck to coordinate with the L-39 jet or the helicopter serving as camera platforms capturing photos and video of the A350 as it was banked back and forth across the moon over the Mojave by Laura or Shane. Day Two in flight was a re-do of everything already coordinated and put into place from the night before, but this time the super moon was on the rise. The A350, with either a helicopter or the L39 jet at its wingtips, took off together four times out of the Mojave. Everyone seized their moment, and captured the legacy imagery in a perfect aerial ballet of aircraft, high-tech gear and consummate craft masters at helm and lens. Delta pilots and techs back on the ground seemed as awed by the film production crew's professionalism as the production crew was by Delta's mad aviation skills. Popeye continued, "When Pouya showed us the video, I swear it looked like we were pure vertical. All you see was the nose looking down along the fuselage and you see just runway below. You'd swear we were a rocket ship!" "Working with Popeye and Laura was challenging and rewarding," said First Office Shane Capaldi. "We were a well-oiled machine and were all very much involved in every flight. We were either flying, coordinating with ATC, or the photo aircraft or monitoring the airplane performance. Our combined experience, airmanship and professionalism helped to make this challenging environment safe, and very very enjoyable for everyone involved in the 3 day photo shoot." Paul Schwahn from TechOps echoed that sentiment in his role's unique way when he said, "I feel a sense of pride because the A350 has dominated my life for the last three years, and when I see those images it shows me what we've been able to accomplish." All that, and there really is something special about that A350. "The thing for me is the excitement that this airplane has brought to Delta," reflected Bill Ward, the A350's Fleet Manager, also in TechOps. "It's going to take us to the future." Clint Culpepper, a Tech Services Specialist in TechOps, whose mechanical expertise with the plane was also called on for the shoot, said that the Mojave Desert production was "probably the coolest thing I've ever gotten to do at my 27 year career here at Delta. It really was a once-in-a-career type of opportunity."